Mindanao, in the southern Philippines, has been the landscape of religious, social and political conflict for more than 500 years. The Magindanawn people, who embraced Islam after contact with Malay Muslims in the late 1400s, have experienced clan rivalries and other outsider aggressions leading to disenfranchisement and displacement from their ancestral domain in west Central Mindanao. In the activism and rebellion of the late 1960s and early 1970s, Magindanawn people were often caught between Philippine military forces and the Bangsamoro mujahideen. In the 1980s, there was some respite but, until the present-day, the people and the land have been subjected to continual skirmishes and sometimes all-out war. In the mid-1990s, Datu Ibrahim "Toto" Paglas III wanted to fulfill his father's dream of establishing a plantation in their homeland for community benefit. 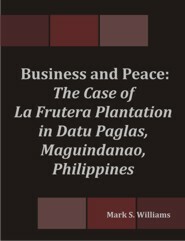 Touted as the "Datu Paglas miracle," the La Frutera banana plantation came into existence in the midst of intercultural disharmony and regional conflict. This, then, is a comprehensive, descriptive case study of La Frutera, Incorporated. Mark Stephen Williams completed two undergraduate bachelor's degrees, BA Political Science and BA History, at the University of California, San Diego, and later received his MA in Intercultural Studies from Biola University, La Mirada, California. He has has served many years as a research anthropologist for a Christian NGO called the Society for International Ministries, Inc., which is registered with the Securities and Exchange Commission (SEC) in Makati City, Philippines. He has served as adjunct faculty for the Asia-Pacific Theological Seminary, Asian Theological Seminary, and Koinonia Theological Seminary. Dr. Williams has presented papers to the ATS Theological Forums in 2007 and 2009, as well as to the 5th Conference of the Ateneo de Manila University Center for Asian Studies (ACAS) focusing on “Religions, Regionalism and Globalization in Asia” in February 2008. He is the author of numerous articles researching the Bangsamoro Muslim peoples of the Philippines, especially the Magindanawn.